Safety Auditing is a tool developed by US-based Praxis International focused on the formal justice system response to domestic violence. An audit is a systematic review of policies, procedures, and practices. Safety Audits assess whether women’s safety is actually promoted by the justice system policies and procedures designed for that purpose. A safety audit is conducted by a multidisciplinary team drawn from the institutions/systems being audited that examines whether work routines and ways of doing business strengthen or impede safety for survivors. The audit team reviews all aspects of an interagency response to violence and looks for gaps that may create safety risks for survivors. The audit is focused on understanding how 1) a survivor becomes a legal ‘case’; 2) responses to that case are organized and coordinated within and across intervening agencies; and 3) risk factors and safety vary for each individual survivor. The audit team conducts interviews, observational research, and reviews the paper trail created as systems respond to victims. Analysis then focuses on how risks for women result from the systems that are in place and how those risks can be eliminated. This process provides critical feedback into the community response to cases of violence against women. Many resources including overviews, videos and testimonials are available from the Praxis International Safety Audit Resources Page. Templates, illustrations, and worksheets outline the Safety Audit’s philosophical underpinnings, clarify the data collection steps and methodologies, and provide a knowledge base for the team’s work. The result of a Safety Audit generally is an extensive report, such as the St. Paul Blueprint for Safety. More discussion of the Blueprint for Safety can be found in the Legislation module. 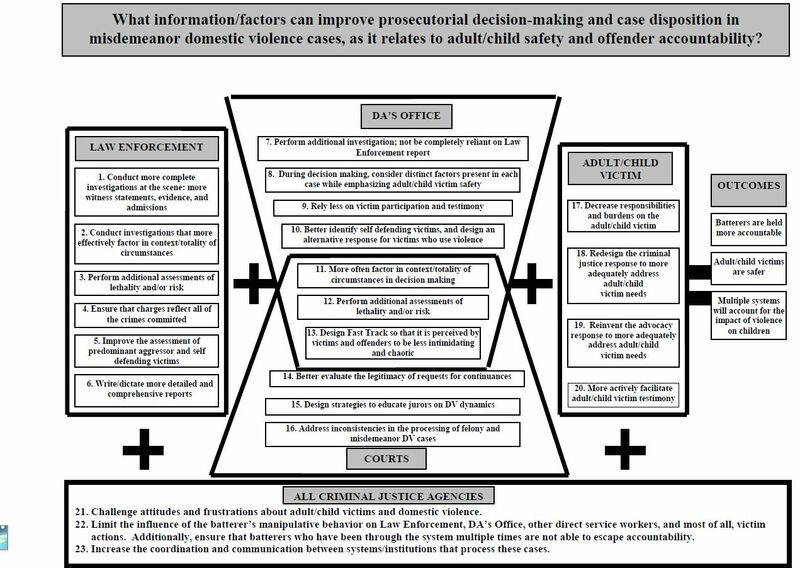 Graphic representation of gaps in the justice system that can negatively impact women’s and girls’ safety are also helpful outputs from the auditing process such as this graphic from a safety audit in the US state of Colorado. Note that in the diagram below, DA = District Attorney. Source: 2007. El Paso County, Colorado Institutional Safety and Accountability Audit Report, p.27.